If you're heading to the great outdoors, Comp Cams offers camshafts designed specifically for marine applications where low idle speeds are necessary and where restrictive exhausts require special cams that work well against wet exhaust system back pressure. These unique camshafts generate an extremely wide powerband, offering the low-end torque needed to jerk skiers up quickly and the high-end power needed for maximum performance. 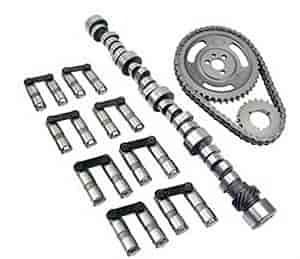 Also, Comp's larger camshafts are engineered for engines with less restrictive exhausts and drives that will tolerate higher idle speeds. An excellent choice for jet boats or power boats. COMP Cams 505-16 - Positive Stop PTFE Seals Guide Size: .530"